Of a republic for the working class, economic liberty! I've posted before about my visit to Kilmainham Gaol in Dublin, where the surviving sixteen leaders of the 1916 Rising were taken and shot; the wounded Connolly having been tied to a chair to face the firing squad. There are no fights, differences over musical policy, or general skulduggery, we remain as good friends as when we first played together. We just have a simple wish to finish up at the top our game after 25 years of relentless touring and, as always, on our own terms. In their remaining year, they'll continue to tour, and are working on one final album, Last Call. I will get a copy, and attend as many of their gigs as I can. I'll report more here from time to time. Some interesting, if obscure, ceiling art at Grand Central Terminal. Mention ceiling art at Grand Central and the immediate response is likely to be "Oh, yes! The backwards painted zodiac on the ceiling of the main concourse." It's stunning,to be sure, especially since all the accumulated tobacco smoke grime was removed in a process that ended in 1998. As to why the constellations are reversed, there are various theories. Shortly after arriving in New York some forty three years ago, I noticed another piece of Grand Central ceiling art (see photo above). There is a corridor between the northern edge of the main concourse and Lexington Avenue, adjacent to the Graybar Building. (I never noticed those rat sculptures--have to check that out.) The corridor has a vaulted ceiling; from the center of each vault hangs a chandelier. The vaults are all painted white except for this one, on which each facet of the vault bears a painting. The western panel--the one you see first as you're walking from the street toward the terminal concourse, shows a box cab type electric locomotive equipped to get power from a third rail instead of from overhead catenary wires. This was the type of loco that brought trains to and from Grand Central in its early years of operation. In the painting. it's shown pulling a train on a line that's just passed under a very impressive looking viaduct. I'm not sure where this might be. Can anyone help? Update: thanks to readers Steve Kehoe and John Pavlakis I now know that the viaduct is the Highbridge, connecting the Bronx with upper Manhattan. 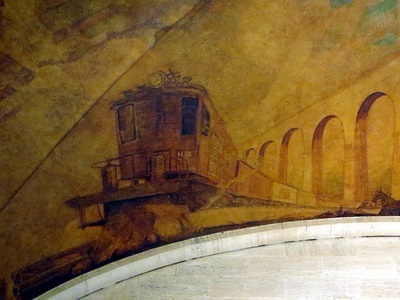 The painting shows it in its pre-1928 condition, as a masonry arched viaduct; it was rebuilt as a single steel arch in order to allow navigation of the Harlem River by larger vessels. 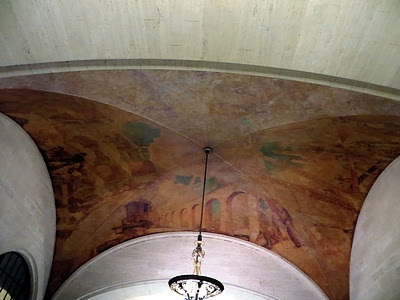 The northern panel shows a construction scene, perhaps of Grand Central itself. The southern panel appears to me to show workers laying track telephone cable (see below). The eastern panel, which you see first as you leave the terminal headed to the street, shows four airplanes (is that a fifth to the right of the pylon?) --three biplanes, one with pontoons instead of wheels, and one monoplane--engaged in a race. Is the vague figure in the background a dirigible? I presume these paintings were made around 1913, when Grand Central was opened [But see below.]. My web research, and cursory looks at published histories of Grand Central, has revealed nothing about them. Does anyone know about them, especially the identity of the painter? That painting in the Graybar Passage is by Edward Trumbull, who also did the ceiling mural in the Chrysler Building lobby. He was a student of a student of William Morris and was once married to Brooklyn Heights's own doyenne of modern art, Katherine Sophie Dreier. The paintings date from the Graybar construction in the 1920s. Regarding the date of the painting, I should have paid more attention to the aircraft. The monoplane (second in the race) looks remarkably like the Ryan christened Spirit of St. Louis and flown by Charles Lindbergh from Roosevelt Field, now a shopping mall, in Garden City, New York, to Le Bourget field, Paris in 1927. Q. In the passage that leads from Lexington Avenue to the Grand Central Terminal, under the Graybar Building, I think there used to be more than the single ceiling mural now there. Can you shed any light on this? . . . Maria Carmiciano, Manhattan. A. 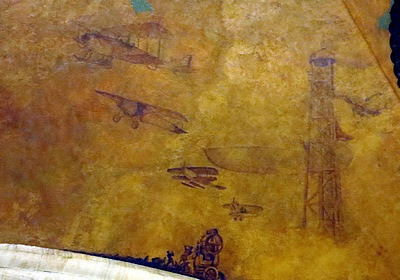 You probably do remember more murals, but period photographs and written accounts indicate that they were only cloud forms...The artist Edward Trumbull painted an industrial panorama, four sections showing railroads, airships, telephone communication and skyscraper steelwork. Trumbull also did murals in the Chrysler Building and the Oyster Bar. 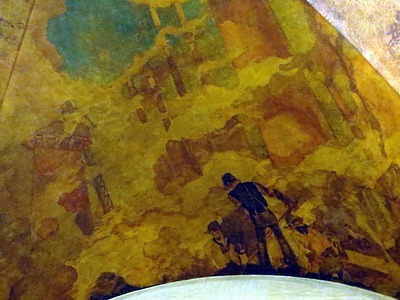 In 1927, The New York Times noted that the other ceiling panels were painted only in imitation of cumulus cloud forms, which have indeed been painted out, perhaps because later owners considered them just smudges of white. S. J. Vickers, writing in The Architectural Record, praised the main mural and regretted that Trumbull had not been retained to do all the vaults. 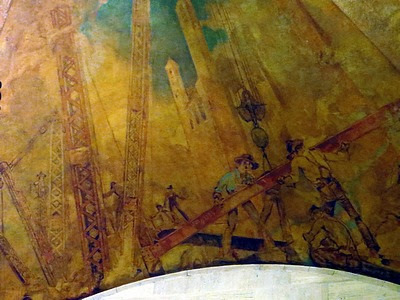 This corrects one surmise--that the workers depicted on the southern panel were laying track: actually, they are working on telephone cable--and answers a question: Were there once paintings in the other ceiling vaults? The answer is yes, but only of clouds.